*Authorized Dura Supreme Cabinetry Dealer* Countertop Shoppe is one of the best kept secrets tucked along 29th Street in Topeka, KS. Clients are surprised by the wealth of products available here and thrilled with the exceptional cabinet and countertop installation. Quality cabinets and countertops are well paired with kitchen and bath design expertise to make every project a resounding success. Building Beauty & Value to Your Home. Working with our customers to provide the style and design that they want, at a price that will work within their budget. PDQ Construction is always trying to find ways to improve. We continue to take classes though out the year to keep on the cutting edge of the remodeling business. PDQ Construction’s carpenters are some of the best around. They receive high marks and compliments from all our customers. PDQ Construction is committed to providing quality work on all their projects and leaving each and every customer happy with the job at the end. "The bitterness of poor quality lingers long after the cheap price is forgotten." 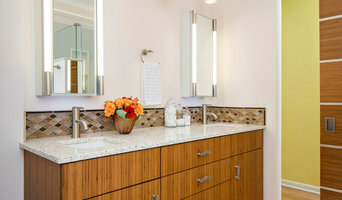 Bath & Kitchen Company is a one stop kitchen & bath design center located in Lenexa, KS. 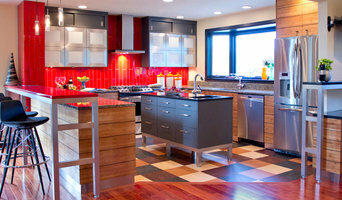 We specialize in kitchen and bath design and countertops for new construction or remodeling. We have a diverse selection of quality cabinet lines from Mid Continent, Shiloh, Dynasty and Omega. We also offer an extensive selection of granite, laminate, solid surface and quartz countertops from top manufacturers such as WilsonArt, Formica, Silestone, Cambria and Corian and many more. We also have an extensive selection of hardware, accessories, shower doors and LED lighting. Have your own kitchen, bath or closet design idea? Our professional designers will work with you to provide a custom kitchen and bath design that looks and functions the way you want. Big or small, our designers will help turn your vision into a reality. If you have a project that you don't know what to do or want to us to handle the project for you ask our designers for more information. Our promise is to deliver the best design and value for your kitchen, bath, closet or countertop. Visit our showroom today for a FREE consultation. We look forward to meeting and working with you! 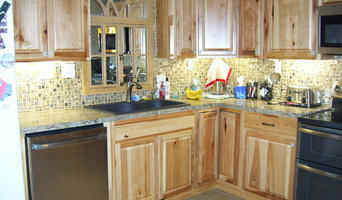 Custom Wood Products, Inc. builds superior quality kitchen, bath and home cabinetry at a reasonable and fair price. 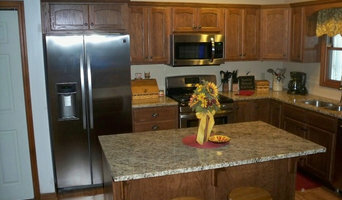 We also provide granite, quartz and a variety of other solid surface countertop options. All with world-class guidance, support and service that is unmatched in our industry. 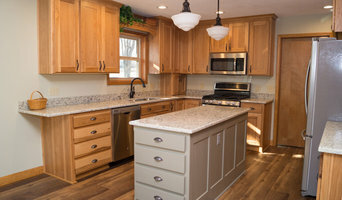 We want to help you love your kitchen, we have over 42 years of construction and cabinetry experience and try to make your remodeling experience easy and enjoyable. Kathryn G. Focke, CMKBD, (“Certified Master Kitchen and Bath Designer,”) and her team of tradesmen have years of experience in assuring your project’s success. With over 30 years of industry experience, Kathryn has been nationally recognized through design competitions, industry awards, printed publications and meets specific educational requirements that keep her current on local building codes, safety and environmental regulations in addition to the endless new products and equipment on the market. KGF Design has been designing and completing kitchens and bathrooms in the Manhattan area since 2003 and has many satisfied clients who would be happy to discuss their project and the value of using a reputable, professional firm to guide you through the complicated and stressful remodeling process in your home. KGF Design uses only reliable, licensed tradesmen to bring your project to completion within a reasonable time frame with no “surprises” at the time of final payment." Count on the professionals of All Inclusive Construction & Design LLC to dedicate themselves making your unique home, build vision a reality. We understand that each detail is important in creating the look you want to achieve and the beautiful home you deserve. We take pride in providing you with quality construction that is built to last. There's a difference between doing the job and doing it right. Our professionals take pride in the quality of the materials used for your home's construction, and the meticulous attention to detail provided on all aspects of your project, regardless of its size. What does a Louisville kitchen designer or bathroom designer do? A kitchen and bath design professional in Louisville, KS knows to take all of these crucial points into consideration and can help plan the layout, materials and overall look and feel of either of these rooms in your home. Kitchen designers, as well as bathroom designers, are constantly staying on top of trends in the ever-changing industry. The designer also knows the best layout for your room, and can configure the layout for optimal functionality and utilization of the space. In the kitchen the refrigerator, stove and sink should be laid out in relation to one another, and it should be seamless and easy to move from one to the other. A Louisville kitchen and bath designer will know how to work with a contractor and architect to plan the flow of the room to work best for your needs. Here are some related professionals and vendors to complement the work of kitchen & bath designers: Kitchen & Bath Fixtures, Appliances, Tile, Stone & Countertops, Cabinets & Cabinetry, Woodworkers & Carpenters. Before you talk to bath and kitchen designers in Louisville, KS, consider how you will use the room. For your bathroom, is it necessary to have a bathtub for bathing kids or pets, or would a shower suffice? Perhaps all you need is a half bath for downstairs or a smaller guest bath for occasional use. Similarly, for kitchen renovations consider your cooking habits. Do you eat out every night but need a space to entertain in? If so, a smaller kitchen might be fine for you, with a space devoted to wine storage or a bar, whereas others might prefer a bigger stove or extra cabinets. When interviewing Louisville kitchen and bath designers, make sure to share these habits so they can best fit the room to suit your needs. Find a Louisville kitchen designer or bathroom designer on Houzz. Narrow your search in the Professionals section of the website to Louisville, KS kitchen and bath designers. You can also look through photos in Louisville, KS to find a kitchen or bathroom you like, then contact the professional who designed it.